My continuing exploration of sheep's wool from various breeds around the world following along with the Fleece and Fiber Sourcebook. I've been purchasing Breed Boxes from Namaste Farms and enjoy listening to Natalie's informative discussions of the featured breeds with Martin Dally on Namaste Farm's BlogTalkRadio cast. Each breedbox is shipped blind, so you have to wait to find out what breeds the samples are from. This changed my mind a little bit about Icelandic wool. I've spun Icelandic top before and it was a super pain to work with. I've heard it's great for felting though. These samples were OK when you separate out the long outer coat called tog from the fine inner coat called thel. While listening to the BlogTalkRadio cast, Martin instructed listeners to pull the tippy end to separate the hair from the more downy wool underneath. The tog is about 2x the length of the softer thel staple. There is definitely a big difference in texture and a nice soft undercoat. The most eye-catching aspect of the breed is the variation of colors and patterns. Genetically, Icelandics have one of two base colors, either black or moorit (brown). They exhibit 5 pattern combinations: white, gray, badgerface, mouflon and solid. Individual sheep may also display various shades of these colors/patterns, ranging from white, cream, light gray, tan, caramel, milk chocolate, silver, dark chocolate, dark gray, to jet black. A spotting gene adds even more combinations with many recognized and named patterns of white markings. I was surprised by these samples. There are a couple different types - Double Coated and Single Coated. It was the Doubled coated that threw me off because at first glance I thought it was Icelandic. It looks so similar, but on closer examination it is actually much softer and more of what I'm used to seeing. However, one of the marvelous aspects of the Shetland is its variability within the breed. A small spinner’s flock can produce ultra-fine Shetland yarn for handknits as well as coarser, but equally gorgeous yarns suitable for sturdy socks and warm outer garments and remarkable tapestry yarns. Shetland sheep have for generations been noted for their very soft and well crimped fleece. The wool is the finest of all native breeds and shows an amazing variety of colours and markings. There are 11 main whole colours and 30 recognised markings. By selecting from coloured fleeces a range of naturally coloured yarn can be produced. This eliminates the need for dyeing and therefore retains the soft feel of the natural fibre and is favoured by those who prefer a totally natural approach. Shetland wool fibres are of a simple construction with a central cortex covered by a thin scaly cuticle, and have an average diameter of about 23 microns. However there is a range from 10 to 20 microns for neck and shoulder wool to 25 to 35 microns for britch wool. The average staple length is 3.5 inches. The amount of crimp varies, and is important in providing the ‘bounce’ required for knitwear. There is a positive correlation between fineness and crimp, with wool of the finest quality being crimped at between 8 and 12 to the inch. Wool from Shetland sheep is used to produce gossamer lace, the famous ‘Fair isle’ knitwear, and fine tweeds. Staple varies depending on type of Shetland: 2-4.5 in. in general; North American Shetlands have range of 4-6 in. ; longer fleeces 6-7 in. This fleece has a very short staple length and almost appears to be a bunch of second cuts. I initially thought it was the Shetland fleece because the color and reminded me of a Shetland fleece I just purchased. It's very crimpy and the sample was fairly clean. It's a milk chocolate color with blonde sun damaged tips. It feels similar to a Jacob fleece. Surprisingly I like it a lot. I'm not sure why since it isn't the softest texture and probably not long enough to spin but there is something appealing about it anyway. I think I'm just partial to really crimpy locks. Anyway, I can't stop playing with it. OK, nothing remarkable here, but not bad overall. It has a nice black color and long staple length. It feels a bit like the Icelandic or a Karakul. I think it would make a good rug wool. The Hebridean sheep is one of the primitive breeds comprising the Northern Short-Tailed group of sheep from northwestern Europe. These sheep are relatively small and fine boned, with black or dark brown wool. The face and legs are largely free of wool and are covered with glossy black hair. Both sexes commonly have two or more horns; but ewes may be polled or scurred and some may carry large woolly topknots. Ewes typically weigh 35-40kg and rams proportionately larger. The legs are slender and the feet are small, with hard, black horn. The body is relatively long. These sheep are slow maturing and are not inclined to carry excess condition; mature adults, even on good keep, rarely have a body condition score greater than 3. 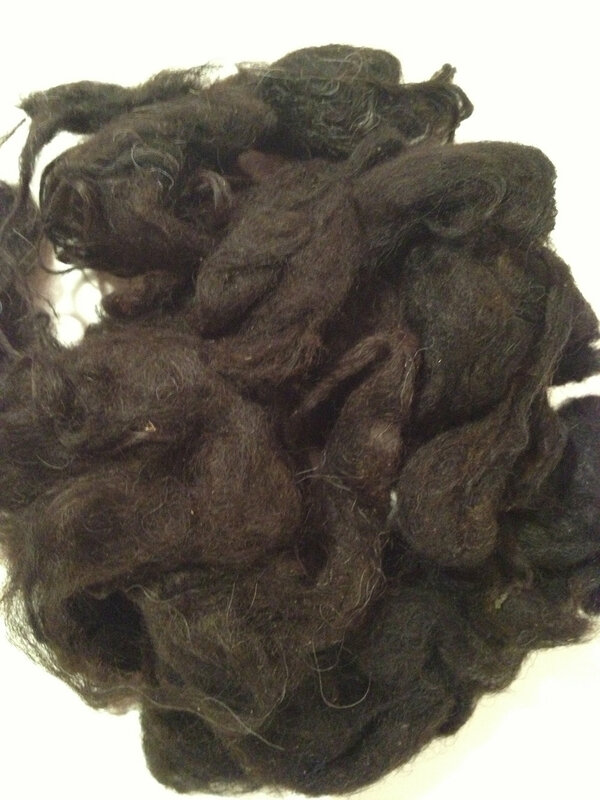 Adult fleeces range from black to dark brown; fleece tips may become brown through sunbleaching. Lambs are born truly black; fleeces on many yearlings become quite brown before the first shearing. Some sheep go grey with age, particularly on the flanks and the coarse wool of the hindquarters. Lambs may be born with a white spot on the poll or elsewhere, but this generally disappears within a few weeks. Some animals have a double-coated fleece of fine underwool overlaid by coarser fibres. Some rams may carry a mane or a ruff of coarse wool. Fleeces may range from dense and coarse to fine and soft, with the average ewe fleece weighing about 1.5 kg and ram fleeces about 3-4 kg. The staple length is 3-37 cm, with any crimp varying from slight to moderate. Fibre micron count has been measured at between 33 and 38, which equates to a Bradford count of 45-50. This is what Hebridean Sheep originally looked like. Over the years, relentless selection for 2 horned sheep, whilst producing some stunning animals for the show ring, has resulted in sheep like these becoming incredibly rare. Note particularly the original fleece type and colour distribution. At Wester Gladstone, we are desperately trying to keep the original type of sheep alive.Photo courtesy of Dr David Kinsman. Staple: 2-8 in. ; generally 2-6 in.